OXFORD, Miss. – George W.K. 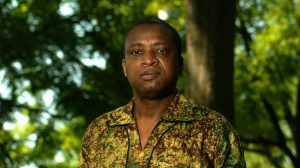 Dor, professor of music at the University of Mississippi, recently delivered the fall lecture for the University of Georgia’s Institute for African Studies. Dor was invited as guest lecturer by Akinloye Ojo, the institute’s director. The institute highlights a different discipline each year for the lecture series, and this year’s focus was music. His talk covered a multitude of related themes, including diversity in African indigenous music cultures, how historical evidence can be derived from music, and the common features across different genres of African music despite their differences. It touched on links between music and diverse fields such as history, politics, religion, gender and ecology. Dor, who also is the UM McDonnell-Barksdale Chair of Ethnomusicology, is known throughout the community as founder and director of the Ole Miss African Drum and Dance Ensemble. Increasing awareness of cultural diversity is the focus of Dor’s creative works. He initiated and coordinated the Black History Month concert at UM, even composing music for it. Widely known in his home country of Ghana as a composer, performer and teacher of Ghanaian music, Dor has composed more than 60 choral pieces, a symphonic suite and five one-movement orchestral works. Dor said he was “honored, but humbled” to be invited to lecture at Georgia, and while on campus, he also was interviewed as part the Athens public radio station’s 20th anniversary of its “African Perspectives” program.